Sitel Work at Home Jobs – Hourly Pay & Benefits! Published March 20, 2013 By Anna T. This post may contain affiliate links. Regardless, I only recommend sites I've researched and/or used and trust. 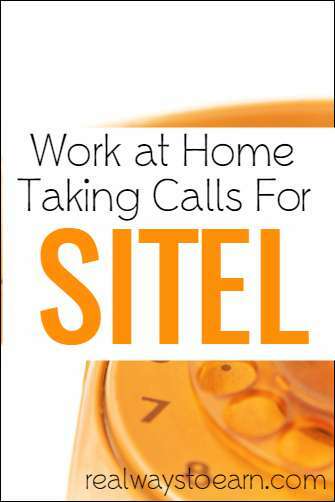 Sitel work at home jobs are almost always open. The company offers a work at home call center position with some nice benefits that are made available to you once you have worked for them for 90 days. Additionally, the calling is all inbound, so this is a plus if you're not a fan of outbound calling. Sitel has been in business for 26 years and they provide customer service for many well-known brands. What is the Sitel pay rate? Sitel does not list the pay rate on their website. The only thing the website says about the rate of pay is that it varies depending on the skill set needed for each client. However, I have searched the work at home forums and some say it starts at around $9 to $10 hourly. The company does offer raises at various intervals during your employment and you are paid by the hour instead of per call. Sitel will pay you bi-weekly either through direct deposit or with a pay card. Sitel does not hire in every US state, but fortunately it isn't too limited. Sitel hires in the US only for work at home positions in the following states: Alabama, Arizona, Colorado, Connecticut, Delaware, Florida, Georgia, Idaho, Illinois, Iowa, Kansas, Kentucky, Louisiana, Maine, Minnesota, Mississippi, Missouri, Nebraska, Nevada, New Jersey, New Mexico, New York, North Carolina, Oklahoma, Pennsylvania, South Carolina, South Dakota, Tennessee, Texas, Utah, Virginia, Washington and Wisconsin. It is preferred that you have previous customer service experience or sales experience, but those things are not requirements. Your chances of getting hired are probably better if you have past experience in customer service/sales. I should mention here that one of my readers went through most of the application process — about two hours worth of time spent — only to get a “we're not interested” email afterward. So just be mindful that the application is fairly time consuming and even if you make it as far as the voice audition, that's no guarantee you'll make it in. You can see a lot more info on tech requirements on Sitel's job information page. After you have worked for Sitel for 90 days, you may qualify for medical, dental, 401K, vacation/holiday pay, employee discounts with some of Sitel's clients. This isn't a super flexible job. Your schedule will depend on the client you are working for. According to Sitel, there are part-time and full-time opportunities available. Related: Work from home phone jobs with flexible schedules. Sitel work at home jobs require three to six weeks of training before you officially start working, but you will be paid hourly for your time spent in training. Sitel does not bend very much when it comes to training. You will have to show up for every session. Not doing so could result in your being dropped from the project. You will find a ton of info here in Sitel's FAQ. This should answer most of your other questions. Many people who have gone through training, interviews, etc. and are actually working for Sitel from home seem happy with the position. I've read some good things on the forums. However, I have also seen complaints from people who are in the midst of the training/interview process. This can apparently be sort of sluggish sometimes. I would recommend doing a search on Sitel at Glassdoor and Indeed. On those sites, you'll find lots of user reviews. Update: Since this review was originally published, there have been tons of reader comments posted below that provide lots of insight into the hiring process. I encourage you to scroll down and read them if you're looking for more authentic feedback on Sitel. Go here to start the application process with Sitel. Just throwing it out there that, yes, they will show you the job offer and let you sign it then not call you back. This happened to me a few years back applying in person at Sitel. Went through everything, she showed me the job offer, I accepted and signed, then didn’t hear anything. When I finally got ahold of someone about it, they had changed their mind at this time. I believe I finally got something very vague out of them about my credit score. I have never heard of a company rescinding an already accepted job offer because of your credit. Were any of you hired as a temporary employee and how long did you work for Sitel before becoming a regular full-time employee? My wife will be starting the Starbucks campaign soon. I am scheduled to start training (Starbucks), but I am having login issues. I understand that there is supposedly an IP Equipment session, yet I haven’t gotten any info. Any suggestions who I can contact for assistance? Hi Pat! When were you hired? I am supposed to start 11/22 and the training sessions for this were 11/17, 11/18, and today, 11/19. I received an email from the work at home people. You might be able to email them. Not sure if I can leave an email address here in the thread so find me on Facebook, Ashley Ayers Patrick, and I will give you the info. I work for the Starbucks campaign now…its a lot of long hours but then all of a sudden the calls stop and they offer voluntary time off. I like Sitel just not a fan of this particular campaign…its not a challenging job, just super busy. Curious about this as well. I was told that this is a seasonal opportunity. I asked if there is the possibility of becoming a permanent position and was told yes. So my question is, of the people hired on as seasonal, how many were retained permanently? Does Sitel do a credit check and do we have to pay for the background check?? SiTel pays for drug screen ng and background check. I work for sitel and did not have to put out any money to work there. I recently got offered a campaign with TRU and was wondering if there is anyone out there that is currently hired with them or starting with them that may know if they require a landline, I have been trying to get that information since its no where in the emails Ive received all it says that I would need is a stand alone monitor and internet, would this be a chat kind of customer service? When will you know you training schedule after receiving the equipment? I was suppose to be on the Starbucks but no one mentioned having to have a landline. THey sent a phone that hooks up to the pC but I am confused now since I got this in the mail but no start date, time, or anything. I’m on the starbucks campaign and they supply all the equipment but a 19″ computer screen and you need to provide high speed internet. Starbucks is a very very busy campaign very busy. Good luck…been working for them since August and its exhausting. no landline needed for starbucks. The calls come through the internet and computer modem. I am currently on the same campaign (TRU) and they send you an Avaya phone that hooks up through they Wyse (the computer component that they send you) They only thing that is required for this Position is a Monitor and good internet connection. A personal computer is Probably needed as well. I completed an application with Sitel, how do they do the interview process, is it in a group setting? At least, that’s what I gathered from the email. Thanks in advance. I was hired for the Toys R Us campaign.. got my drug screen paperwork and background paperwok.. Esigned the documents and everything. They sent me another email to do an assesment again and schedule an interview… they never called for the interview. I dunno what that was all about at all. I wasted my time on Sitel. I have previous customer service experience, put in my resume,did all the required tests, and I even got my interview. The woman over the phone made it sound like i was about to get the job because she kept saying how well I did on the tests etc…..Then came “I’m sorry but right now we aren’t interested”. She did however say she will keep my application open in case something opens up with my skill set. Pretty much to me that says “Thanks but you don’t qualify”. A lot of hoops to go through just to get told no at the end. What a let down! Please tell me what you have to do to get on here. I have tried and they say they will get back with me, but I never hear anything. I was a school secretary for years and to me that is just as much as a customer service representative in both jobs you are dealing with the public. And there is a test, why do some people have to take the test and others watch a video and tell what is going on. Please let me know what you guys did to get on with Sitel. I hear it is a very good company to work for and I really want to do something from home. HELP!! What position did anyone put when they applied for a job with Sitel? I really want to get on with them they will send me a message that they are going to review my app, but I still haven’t heard anything. How do you get hooked up with a sponsor or whatever they are called. I was a secretary for years and to me that is just like a customer service rep only in a different setting. How do you get hooked up with a recruiter? I need to start working, but they keep saying they will review my app and get back with me. How did everyone else get on? Hello to all. I recently applied for Sitel at home positions, did all necessary assessments and at the end of the telephone interview she said she will have me doing a new Toys R US campaign for email inquiring. She said training starts either August 1st or August 7th and she will call me back in a couple of weeks to complete the process. I want to know has anyone else been hired for the position and did u already complete the drug screening and background check and did they send u ur material for the campaign. I’m afraid they may forget to call me but she said she put me on the list. She offered Macy’s and Cox cable but I declined. Hello Japri, After interviewing with a recruiter I was told the exact same information about the Toys R Us campaign , but have not received an offer letter or information for background check or drug test. I was told I would be listed as active for the campaign but it wouldn’t start until August. Have you heard anything lately? Hi Kris, I actually am now working for the Starbucks campaigned because when I inquired about Toys R US I was informed training got pushed back to the 30 of August, and that was too long to wait without income so Terri (my recruiter) found me something sooner for August 16th for Starbucks. I start tomorrow. If u ask your recruiter if there is any other campaigns starting sooner they will try to find you something else. I got lucky and hopefully you will too. Its worth a try. Hope it works. I have an interview with them tomorrow at 12 est. I worked for them about a year and a half ago on the Starbucks campaign and loved it. I had to to quit because my grandmother became ill and I had to take care of her. Sadly she passed away. So I am now trying to get rehired. *fingers crossed*. Does anyone know which campaigns they are hiring for right now? Hopefully the Starbucks. And does anyone know if they will do another speedtest tomorrow during the interview? I already done one when applying before it would even let me get any further int he application process to do the assesments. I recommend trying to steer clear of the Cox campaign. Starbucks sounds like it’s great, Cox billing was not. It is a hard sales position trying to add products for customers calling in for billing. The systems used by Cox are convuluted and outdated and the training was inadequate. I’ve heard you can make a lot of money on this campaign but that was not my experience. Do you have to have a landline and pass their Internet speed test prior to them offering you a position? I don’t want to bother paying for landline and increasing my upload speed for them not to hire me. Do I need to have hardwired internet to work for them? The place where I live gives us free wifi connection so I can’t get hardwired internet or a landline phone. I have wifi. I have a cell phone. And I can download anything to my computer. Can I work there? Or does anyone know any places that I can use wifi to work at? Thanks! You have to be hardwired. I have worked for 4 at home call centers including Sitel and they all require hardwired internet. What other work at home places have you worked for ? For anyone that applied with Sitel – do/did you have previous customer service experience? I have very little on the phone but I have had customer service experience basically in restaurants and stuff like that. I have a 19″ monitor that they are requiring of me. What I want to know is what equipment do they send to connect their services to your monitor? They are vague with that information. I start on the Starbucks campaign in March. they will send you a little computer that is only capable of accessing the system needed for work, they will send you all the cords needed, they send a keyboard, if you are a phone rep they send you a headset (its a cheap and uncomfortable one you may eventually want to invest in your own), phone, mouse….just about everything you need to work. I think the only other thing I bought other than the monitor, was a longer cable to connect my internet modem to the computer as theirs was too short for my set up. make sure you have a comfy chair, a radio and or tv near your desk, training is long and boring. I spent more time watching tv waiting for fellow classmates to figure out how to do things, than I actually did learning anything. you will swear your classmates fell off a turnip truck. I got hired for the starbucks campaign as well did they tell you it was temp or perm ? They told this line was seasonal, but if you do well they will keep you. They told me they have other accounts like Macys and Direct TV. I am in training now. Their systems are not very steady. Good luck with your training. Thank you 🙂 Best of luck to you as well !! Looking for more info on work and Starbucks campaign,paycheck details etc..
Hello. Did your training class start on time. I was also offered a position with the Macy’s account training 1/25 but we had just gotten an email saying something has come up with our scheduled training and will be contacted shortly about the change. I have been trying to get on with Sitel. But their computer requirements tool says that my upload speed is too slow, which I know is bogus. I have more than enough upload speed for the job. My computer is also hardwired to the modem. Also, I’ve tried everything under the Sun to get this to work. Anyone here have a similar problem and what did you do to fix it? I’ve tried e-mailing them but no reply. Does anyone know how the Macy’s campaign work? Hi, quick question, I got hired and accepted offer….can anyone let me know, Do I need just a monitor, Or a monitor and a hard drive tower? any insight would be great. I’m on the AAA campaign and initially I was told to get a 20 inch monitor for Membership. Once I was moved over to Emergency Roadside Services, Sitel provided 2 20 inch monitors and all the other equipment I needed. This week I’ve applied on Monday, interviewed Tuesday and received an offer all within an hour. Completed my drug test and background the same day. Submitted my paperwork today and received an email from IT saying my computer should be here no later than Friday at noon. I start Monday the 19th. Does anyone know if they send you a tracking number? The Starbucks Campaign from what I was told is a permanent position. I do believe they have full and part time but I am not sure. After they told me I would be receiving my equipment, I did get tracking information from FedEx regarding he equipment. I am not sure if they always use FedEx I am only able to answer based on my own personal experience. So far, I am in Day 3 of training and I am quite please thus far. Hi do you like the Starbucks campaign? what all does it consist of? I just accepted the offer for a permanent position with them. As I am in my first week on the phones with Sitel on the Starbucks Campaign, in what is called OCP, I must say I am loving it. It is really easy. All I have to do is make the customer happy in general.They have a complaint, praise, incident, suggestion, all I have to do i document it and send it to the proper place by coding it correctly. It is really really easy. Are you still with sitel Starbucks? Iam joining next week…how’s is the work and I see lot of reviews about equipment not working and paycheck not receiving on time. Can you please send me more info…Thank you!! I have never had a late paycheck and I started in Oct 2015. I am still on the Starbucks Campaign and absolutely love it. The only time I know of late paychecks is when they are mailed, especially during inclement weather like snow storms, etc. I would advise you to setup direct deposit immediately. Sitel will send you instructions on your drug test and background check in your email after you are hired. I scheduled mines really quickly online. You will only have 48 hours to get it all done though. At least that is what I was instructed. I was hired with Sitel. I start 10/12/2015 for the Starbucks Campaign. My equipment arrived rather quickly. As soon as my background, drug test, and I9 was processed they shipped everything out overnight by FedEx. I did not get a choice of what campaign I wanted to work but it really did not matter to me much. So far things are going well and I am happy with what I have seen thus far. Honestly, the complaints for this company are universal to all of my previous WAH employers so I do believe that working at home has it drawbacks as well as benefits. I start the Starbucks campaign on 10/19/2015. How did your first day go? Did they mention what type of calls we would take from customers? My first day went great. We will not be doing any sales at all. It will be calls for product information and such from what I understand. I truly think I am going to love it here. Is the Starbucks campaign a full time permanent position, or part/full time seasonal if you don’t mid me asking? I was told full time permanent. That is what is also on my offer letter. Day 3 of training and it is still nothing being said about it being seasonal. To Ann I had the same problem Friday 8/28/15 The HR lady was suppose to call me and she didn’t call me until four hours later and she apologize and said it was her fault. I remeber my neighbor working from home for toys r us so I asked her was it with Sitel she said yes while i had visited her during the times she was at work I witnessed Sitel and the response help was terrible. The pay isn’t that great and she said that she had trouble logging on which I seen that for myself so now that I have found out who I would be working for I think I am going to cancel my interview with them. I cant afford to pass up other good interviews just because I want to work from home If i have to get up with everybody else and travel to work so be it . Hi Mattie may I ask after the drug screen test how long did Sitel get back to you? I was hired for Starbucks as well and will start training on the 5th of Oct. I just got invited for a phone interview for the seasonal job as a interviewer for this company, Has anyone held this position before and if so can you share some experiences, how long is it for , and there is a possibility if all goes well if it can turn into a more permanent type job ? I decided to apply earlier this year and was shown numerous times how incompetent Sitel is. My initial interview was pushed back because the work@home rep didn’t map out her day in a professional manner. Among the paperwork that was required in the hiring process was one sheet that specifically stated for me not to fill out yet I received numerous emails telling me that it was missing in the documents I was supposed to fill out and send back. My easily spelled name was misspelled in the system affecting my ability to even log into certain web pages required during training. Out of fifteen of us training only one person was able to sign into the training system per Sitel’s instructions. When the lack of us being able to log in properly was brought up we were told it was a big no-no to bypass their instructions in order to login but not to say anything to anyone about it. The training was completely outdated and backed by tools that didn’t even work in the training system…tools needed to provide tech support to customers but oh well. Training was boring and honestly kind of pointless in many areas. When the time came to go “live” the process was so drawn out that it made the transition more stressful than it already was. Calling anyone in Vegas is only met with silence, which the headquarters in Nashville knows but does nothing to fix. And now with the AT&T merger comes more demands for the same mediocre pay and zero training in dealing with anything AT&T. Q&A nitpicks every little detail of your calls and even gives you negative marks when you’re doing what the script tells you to do. Sitel’s a joke and should be avoided at all costs. I noticed the HR is also outsourced. Are you in DTV campaign? I was hired on 07/09/15 at Sitel. I started 07/12 and I LOVE IT!! I am on the DTV campaign. Thank you so much for this site! When did you get your equipment? My training will start on Aug 10 but I haven’t gotten anything yet. Thanks! Oh and congrats! i was hired for sitel starbucks anyone else whats its like?? Hi – Have you started your job with Starbucks yet? I was hired and start training in 2 weeks. I was just wondering if you can tell me how it is. Hi! I was hired for Toys R Us and training starts tomorrow. But I haven’t received anything yet but the contingent contract which stated that I will get my contract in the mail and equipments prior to the training date. Is this normal? Please help please. You should receive it by now because you are required to set up the equipment prior to logging in on your start date. If ever you run into technical issues you have time to resolve it with IT. I received my equipment on Friday and started training on Monday, If I were you, I would call HR/IT about it. So you haven’t done the other paperwork? I emailed the one who hired me last Wednesday but she said if another paper is needed HR will email me. Then Friday I emailed again asking about the equipment and papers no response. If I didn’t get hire or failed background check, I will get an email right? It’s better to call them asap. I don’t think you also received email from your trainer which contains info which site to log in to since you didn’t receive the paperwork during hiring process. Worst case scenario would be to schedule you to a later training date. Just my two cents. Yeah should I call the person who hired me? Do you have their number? I was not given an option. I was hired for Starbucks. I start on August 24. I did get a call asking me if I wanted to go on a different campaign, but I missed the call, so I’m not sure which one they want me to switch to. I was able to contact them and was transfered to a different campaign. Its for hotels. Starbucks started august 10. First and 2nd campaign I wasnt asked i was just told. I start tomorrow. I had an interview today. Is anyone working the Starbucks campaign that has been there for a while? I was wondering if there were any raise in pay along the way? Do you recommend the job? I work where there are no raises, I need to know there is the possibility of increment raises, please help. I was just hired for this campaign. Any info you can give me as what to expect? Are your orientation hours for Sitel the same as your regular shift hours? I applied for a work at home slot, submittted assessments and all PC testing, etc. I PASSED all PC testing with flying colors. However an HR rep in TN HQ is telling me I must live 50 MILES MINIMUM DISTANCE from the call center in my city, and that this “is strict policy they must follow” something along those lines, to protect the jobs in the actual building…anyone else on this forum get response like this??? I feel its discriminatory, as due to my IT class schedule they refuse to work with me on available shifts inside the call center location, also discriminatory. I dont know why they said you need to live within 50 miles of the facility, perhaps for your specific position the training is done at the facility, rather than online, as my position was. I know some online positions are done on site, then after that you do work at home. Which when that does occur, there is a distance requirement. Also, the shift inflexibility is like any other job in the world…you cant work when ever you want to, they are hiring for the needs of the company. sitel hires for specific shifts, 1st shift 2nd shift, 3 shift..etc..not just the hours you want to fill in around your class schedule….so if they hiring for a shift that is at the same time as your classes, they are not required to hire you for a shift they are already staffed for?…it would be like a bank hiring you from 6pm to 10pm because you have school from 8pm to 3pm..make sense? its not discrimination, it is staffing needs…also there is no such discrimination law protecting you from hiring within a distance from work. they are hiring withing that distance to ensure timely attendance, on call, inclimate call-ins, or other such reasons, again standard business practice. I can still put in 6-8 hours per day of work—- just has to be mornings for another 8-10 weeks. Currently their training sessions here run in the building only, like a 10-7 or 2pm-midnight, something like that….I can’t be there at that time as I am on my school’s campus in the evenings! I understand more call volume happens at night, but when I had the day class they gave me same excuse—wanted days shifts to be filled and it conflicted with my class schedule—they told me “wait until school is over”….well I need job now not when I graduate, I can work part time now and full time after school is done, which will be soon!! Trying to get on-the-job experience too that is related to my IT training!! I specifically requested 1st shift during my interviews and was told I would have that. I completed my 5 wks of training and at the end was scheduled 6p-3a and 8p-5a Mon-Fri and Sitel refused to change my schedule or change campaigns even though they had on file what was discussed and agreed to during all 3 of my interviews (thankfully I kept all those emails). For those applying with Sitel be sure to get in writing what your hours will be before you waste your time training. I really had my hopes up with that position and was beyond disappointed when it didn’t work out. Yes it is very important to keep all emails from Sitel, especially from recruiting! I accepted an offer for the AAA campaign back in November. I was told training would begin Jan 5th. On Jan 2nd, I received an introduction email from my trainer welcoming me to Sitel. Attached was the training booklets I needed to download. When I opened these attachments, they were for the Cox Communications Campaign!!! I emailed my trainer back and said there must be some mistake because I accepted a position with AAA Roadside Assistance. She checked with HR and was told no, I am to be with the Cox Campaign. I was unemployed and a single Mother so I could not wait any longer for any adjustments to be made so I told my trainer that I would go ahead and begin training with her and will work it out during training. During my initial interviews I made it clear that I did not want a tech support position and I needed something where I could work early in the day because I home school my son during the early afternoons. I was told it would be no problem as I would be able to choose my own schedule. Well, this may have been true for the AAA campaign but it sure was not true for the Cox campaign. Upon entering training, I emailed HR and let them know I was never sent an offer letter for Cox. I was then sent one on Jan 23rd. I had been in training for 3 weeks. But the offer letter I received was general. It did not say it was for Tech Support at all. And the hours that it had listed as available were not the actual hours available. My shift was going to be 3pm to 11:30pm Sunday through Thursday. Because this “offer letter” was so general, I did not accept it. I never signed it. On top of my issues, more than half of my class had the same or similar issues. All stated they were told there would not be any sales required with the Cox position. This was a flat out lie. Sales is required on every call. You must pitch on every call. You are not required to make a sale on every call but there is a quota to meet each month. But the sales portion was not the issue for me. It was the technical aspect of the job. During the 4 weeks of training, my class had several meetings regarding all of these issues we experienced with Recruiting. We were promised our issues would be address and handled. Well, I am sure they were addressed and handled but only for future training classes. Nothing was offered to any of us. We were told that we had to stay with the Cox position for 6 months before being eligible for changing to another campaign. Even though we were lied to and basically conned into taking the Cox training, we were not allowed to be moved to another campaign. This was “not an option” as stated by Supervisors and HR. So due to this, over half of my classmates left. If you are tech savvy then the Cox campaign might be for you. However, I am not and I made this crystal clear during my interviews. Due to needing the money so desperately, I made the mistake of going forward with the training. It makes me sad because I truly believe that Sitel is a great company to work for. I place the blame with Recruiting. Lying and conning to get recruits gives a false representation of the company. Morale in my class was at an all time low by the 4th week. It was very upsetting. I would definitely work for Sitel again but never for the Cox campaign again. The training material was not good and I am just not cut out for tech support. I left the first week of February. Just last week I received an email from recruiting stating I will be receiving a telephone interview within 60 days. I have stated in the past on here that the communication via emails is very disjointed. The best thing to do is call HR directly. I was hired for the AAA ERS that started in Jan and you did not get to choose your hours at all. Out the 27 people that started in our class only 2 stayed. EVERYONE complained about their schedules and what they were told they would receive yet wr all got ignored and was pushed to accept what was given. HR would never return any phone calls or emails and we were told the same about having to wait 6 months before we could change campaigns and even then there was no guarantee we could be changed. There was a lot of misleading information and “guarantees” and they continued to dodge our concerns/questions. I don’t understand why put out the expense and time of training everyone and not be upfront about what exactly to expect from that position only for everyone to end up quitting? To add some information to my post, initially I had an interview back in October for Cox but it was account support. NOT tech support!! But was called the beginning of November and told this campaign was cancelled. Then I received an offer for the AAA campaign in which I accepted and was told training would begin Jan 5th. I was originally offered the Starbuck’s campaign and was all set to start training then just before I was supposed to start u was switched to AAA without any explanation as to why. If the training can be online does it have to be same schedule as in the call center itself?? Is a user/job candidate/new employee allowed to log in and pace themselves or does this run on a deadline format?? Could hours for training be scheduled like a 1st shift or is it same time as the 10am-7pm/2pm-midnight thing?? Does online classes have to be paid for by employees for work at home slots?? Does the company cover this?? I read in job description Sitel pays $9/hour for training—does this count for online classes too (if offered)or just live and in person?? All I want to know is: can you have a laptop or you have to have a desktop??? Anybody work for frontier airlines, how hard is it? Just had my first phone interview for she did not ask me any hard questions just about my current job. And then about the hours I work I explained I am open and she claimed I would receive a email with follow up info does this mean i did not get the position because everyone else seem to got conformation on the first call A little concerned. You will get a series of calls/emails from different people before you get an offer letter with the position and all of the info about your training. Just be patient. It does sometimes take a while. I’m almost done with my training and so far am loving it. Very nice and helpful people. Good luck! You definitely need to have a lot of patience. I am finally in training BUT all the way up until the Friday before my training began, I was told I as with the AAA campaign. My trainer emailed me to introduce herself and that is when I found out I was on the Cox campaign. I never rec’d an offer letter or anything. Several of us in my training class have been told different things during their hiring process regarding hours and shifts. Many people are upset and some have left. I am sticking in though because I am a single Mother and this is my only means of income plus I am homeschooling my son. Just be prepared and make sure you ask A LOT of questions and ask to get everything in writing. A lot has been said over the phone and cannot be proved. Cover your behinds! This goes for any company you sign up with. What are the clients that are offered through sitel? Had an interview scheduled for today with sitel and I was waiting but I received no phone call. So I called Hr and was on hold for 30 mins just to be transferred to a voicemail. I finally went ahead and emailed them and I received a email back stating that they see that I am down for 2:30 cst which is what I had rescheduled for once they didn’t call me. So now I’m waiting for 2:30 to get here so I can go ahead and do the interview I will update once I’m done. Good Luck. I had to write a follow up since I had my interview on 12/3 and havent heard back but they said I am still active for Starbucks they just dont have a training class scheduled yet! Once of again, best of luck and do keep us posted!! I have a question to those who currently work for Sitel. I am seeking this line of work to have flexibility. Many work-at-home phone positions state that they offer flexibility – but what does that word really mean? To me it translates: A typical day would be to log in at 8am and work for 3 hour shift. Then take a break of 3 hours to run errands, and deal with family issues. Then log in at 3pm for a 3 hour shift. Then take a break of 2 hours, then log in to work either 1 or 2 more hours. This would be a Monday-Saturday Scenario that would be ideal for me. My question is this:::: Is this possible with Sitel or other companies that any of you have heard of? I have been researching many companies, and although I don’t mind the low pay (compared to what I currently earn) the trade-off of working at home would be beneficial. I would want to be paid and not scammed, and I appreciate benefits if I am FT, but understand PT wouldn’t have any. Recommendations?? Hey everyone. Soooo my process with sitel has been long and drawn out, I too am eager to get things going because I need to be able to take care of myself and my 8 year old son. I went through the first interview yesterday and was told that I would have my 2nd interview today at 4:30…4:30 came and went, and to my surprise I never received a phone call! =( I’m trying so hard not to freak out because I am so eager to begin working with sitel. I called HR and left a message in regards to the no call today, so I’m hoping I hear back from someone soon. =( HAs this happened to anyone? Had first interview yesterday, and it went great. I have worked from home for ten years doing chat rooms, tech and billing support. Last position lost a few big contracts and I couldn’t live off the minimal hours anymore. I do have another job where I do Data Collection but with three kids you need all the money you can get LOL….. Anyway, my interviewer said I would be perfect for the Starbucks campaign and that the second interview is campaign based where they go over the scheduling, pay and the position. She changed me to “active” and stated that with it being so close to the holidays they are not looking to start anything until the last week of December. But based on what she said, does that mean that I have the position since she said the second interview is just basically going over everything? And for those who work on Starbucks, how is it?? Thanks so much!! I can tell you that the Starbucks Campaign is a good campaign to work on. I am currently in their OCP for 2 weeks just finished the training class that last 2 weeks as well. Their instructors, coaches, mentors are all awesome to work with. The email campaign for Starbucks is not a hard job at all if you know how to work a computer and follow instructions. It sounds like you got the job. The second interview is pretty much going over everything with you. Looking forward to getting started. She said it was mostly email and chat for Starbucks with some phone support if needed. hi i am to start for starbucks in aug how is it? I was accepted for the Starbucks campaign and was to start training on Dec1st. I just received an email now stating they are not “taking my application any further” with no explanation as to why. I completed all of the new hire forms and had a congratulation email. Has this happened to anyone else and do you know why? This is soooo frustrating! Training for Cox Cable is supposed to begin 11/24. I have not received anything since yet another Welcome Letter after my phone interview. I have emailed and called. I understand they are busy but this is crazy. There is no way I can get the equipment, do the background check, drug screening and the IT Session before 11/24. Is there anyone else waiting to begin with Cox Cable Monday? I think in most cases they don’t ship the equipment until the week before training (so expect equipment next week unless they change it up for thanksgiving). You do need to sign your final offer and fill out I9 before they’ll send it, so if you haven’t done that part I would contact someone. Hi Camille, I’m also supposed to start the training for the Starbucks campaign on Dec 1st but I haven’t received any emails or notice of any equipment. I applied online, did my assessment, and then received an email about a week later asking me to submit my speedtest results. That was 8 days ago and I haven’t received any further correspondence. Does it normally take this long? Do anybody know how long the campaigns last? Well, I just applied for this company on Wednesday and I got an email Thursday to do a speed test and now I received an email to schedule an interview but all the slots are completely greyed out. I see from previous posts that I should just try back later so that is what I am going to do. Hopefully this will work out! Can anyone tell me something about the Starbucks email only campaign? @Val I was hired for starbucks too. I was told the training will start Monday. I did all of the paperwork, background check, drug test and final job offer. I hand not received the equipment. Have you? I’m starting training 11/17, they said they would ship the equipment 11/10 or 11/11. @Val if you don’t mind, could you post when you receive the equipment? I’m asking because I can’t get anyone to respond to me, but I am still able to log in. and I havent been told I dont have a job. I will know to stop trying to pursue this. 🙁 I was really looking forward to this job. Will do, I know exactly how you feel! It is SO hard to get a response from anyone. I still have not heard anything. I have called and left messages and I have emailed everyone under the sun. So, I went to the Sitel site and reapplied. There was no indication that my information was even recognized. I really think I fell through the cracks somewhere. But I find that strange that I would get a Welcome Letter with all the instructions on my next steps and yet never received the next steps. So, we will see what happens now. I really hope I get on with this company. I really need this for my family’s sake. Nevermind.. as soon as I said I have not received it yet.. it showed up lol… Soo I am ready to go. I just received my final offer and it now gives me an additional time I need to be available for a IT session. Is that something I need to be home for? Can I attended remotely / not home on my interest service? I called the HR # today and the young lady on the phone seemed confused. She left my information for a call back but then asked me if I was registered with the site. I told her yes as I have done everything up to the background check and drug screening. I said I would think I am registered because I have gotten emails from Tammy Eledge and Fay Veasey and I have had a 2nd interview. Did anyone else get an email message saying they apologize but the Toys Us campaign for Nov 3rd has been cancelled? I done everything they asked and was hired. The only thing I was waiting on was my equipment to start then I got that email today saying they will call me today or tomorrow with other options but the Toys R Us campaign I was hired for starting Nov 3rd had been cancelled. 🙁 I was soo looking forward to starting work to. I got a call from Peggy Thompson about the TRU campaign being filled and she offered three other campaigns (AAA, Cox and Starbucks) – I selected Starbucks and that starts 11/17. @Joseph have you recieved your equipment yet for the Starbucks campaign? Im suppose to start the Starbucks campaign 11/17 also. I haven’t received any equipment, I have read some reviews, and I am a little worried. I’m supposed to start then too, they told me last week that equipment would be shipped out today (11/10), so probably receiving Tues or Wed. I completed the entire process several weeks ago, I9 accepted by HR, 3 different people told me I’ve completed everything. However I’m so worried because I kept getting emails late last week telling me to do another operations interview and a third contingent offer appeared in my dashboard over the weekend. After the latest person told me I was all set last Thursday, I turned down another job offer so I will be devastated if after almost a MONTH of stress over this terrible process, I don’t have a job with them after all because they’re so disorganized. On 10/16/14 I received an email from Tammy Eledge to scheduled my 2nd interview. I had already done the voice interview and application process and assessment. Then on 10/21/14 I did a phone interview with Fay Veasey and immediately after the interview she sent me a Welcome Letter telling me what to expect next and what to do. Nothing since. No background check/drug screening email. No email regarding the IT sessions. Nothing. I have emailed both of these ladies and have heard nothing. I emailed the provided email for questions regarding the background check and was told it had to be ordered by HR. So I emailed Tammy and still have not heard anything. This is very disheartening as working for this company is greatly needed. Working from home is so important for our family right now. I am giving up a Supervisor position at a major Call Center and taking about a $6 an hour pay cut but staying home is the only option I have right now for personal reasons. So my next step is emailing hr@sitel.com and hopefully I can get some kind of answer so I know how to proceed. Ok so I put in my application really late last Wednesday night (the 22nd), but I did it on my phone so when I reached the assessment it said my browser didn’t meet the requirements. I was bummed but I went to sleep and was going to try again the next day on my computer. I checked my email the next morning (23rd) & I was pleasantly surprised to have gotten an email confirming receipt of my application and another with the links to the speed test and the assessment. I also got a txt saying they were ready to interview me & to respond with my name & # so I did. Then at around 10 I got a call from an unknown number but no message was left. I called the number back and it said it was the hr line for sitel. I got through to someone but was told that the @home recruiting was handled by another dept. so I was given their #. I didn’t get in touch with anybody and left a msg. I got kinda busy that day and didn’t have a chance to complete the assessment but when I checked my email the next morning (Fri 24th) I had an email inviting my for an interview that day for the starbucks email campaign. I set up my interview for that same day in the evening. I got a confirmation email and everything, but when the time came for my interview I didn’t get a call so I checked my email again & it turned out I had another email saying I had cancelled and thank you for letting them know ahead of time. I never cancelled so I was pretty confused. I went to try to reschedule for the next day because when I first scheduled there were openings that day and the next, but when I tried to “book it” it said the interviewer wasn’t available for that time. I figured I had lost my shot, but I went ahead and completed the assessment and voice recording thing & then I tried again later that evening to reschedule just because & for some reason it took! So the next day I kept checking my email up until my appt time to make sure it didn’t cancel again and did end up getting the call. It went very well and my interviewer said she was switching me to “active status” whatever that means and that I would receive an email within 24 hrs with either instructions on background/drug test or for a second interview. I still haven’t received anything. From what I’ve read here it seems like they’re just doing a lot of hiring right now and making some changes to the process, so should I still have hope? !Anybody that was hired for the Starbucks campaign? Would you mind sharing some info? How are you liking it? What is the training like? What schedule did you get? Are the breaks for the email only just like the inbound calling? Any other info? Thanks so much in advance! This hiring process is nerve wracking. I got the email, scheduled, interviewed and was hired. Just gotta work on my paperwork now and I start 11/10! I’ve gone through the application, assessment, voice audition, first interview (where I was offered the position officially), sent the email for the background check, drug test and I-9…just completed the drug test and I-9 today and apparently I am to have another phone interview? Interesting. I think it might have been a double-booking, but I’m going to take it regardless. I’ll update when I find out about the secondary interview, because the first was a very typical interview. Hi all, will be coming to work for the Toy r us Campaign,is anyone on that one and if so how are you liking it ? The process was pretty quick I applied last Sat, and got a call from H.R. a hour later she asked a few brief questions and did a speed test on computer I was then told it was for Toys r us position .when i got off phone i checked mt email and i had contigent offer and background check with drug test ,I did all the same day then on sunday my final offer came in with I 9 forms along with voice audition.on monday I was sent a link to set another interview ,so i scheduled it for same day along with getting my i9 to a notary and faxed . when i had my interview (this time with operations manager ) it was more detailed and lenghly . I was then told there were 3 campaigns i could choose from .I chose macys but he called me back and told me it had closed so i went with the Temp Yoys r us Position , and today( Tuesday ) i got a fedex email saying my computer has shipped and will be here tomorrow .so for me it was pretty quick and organized ,everyone that I have talk to so far has been very pleasant and informative ..I do think they try to get background and drug test done first to weed out some .anyway goodluck to all who are waiting . Hi everyone I filled out the application and after an hour got a text from some 888 number saying they needed my name and number and someone called me and asked what times I was available & she said I was rejected because they needed me 24/7 but then 3 or 4 hours later last night I got another call asking to set up an interview for today in the morning but no one called at all -_- After about one hour I got an email saying they were hiring with a list of all these programs and to click a link to make an interview so I took an interview for tomorrow @ 11:30 AM for the Starbucks email program but idk if I did everything right and how do I know my application process because there’s no sign in or log in? Someone please help!! the first text you got is strange, as I never received a text, but I know they are in the middle of changing their hiing process so I am unsure about that…but when I did interview I did get an interview ( you may get several emails and invitations to interview as there are several different companies that they represent so dont be confused, and dont be afraid to pick the one you like the best) when you click on the link in the email for the interview, it will lead you to choose a time, and then you enter your name…or if it asked you to pick a specific time, it already has your name in the system, and it is just asking you to confirm that time will work for you. Hello I had a very different experience with the hiring process… not sure what to make of it.. I filled out most of the application and was in the middle of the assesment part when they called me for my first interview. It was for Toys R Us. Now mind you I had not finished the assessment i was in the middle of it when I got the call. Had not even checked my email for any of their emails they sent me… Which apparently had been about 12 of them the lady was really nice and asked me a lot of the same questions you guys got. Had me navigate the toys r us website some. Before I got my assesment even finished I had my drug test and back ground papers and the offer signed… Have to go tomorrow for the drug test. Now what is weird is I finally got the assessment done and they sent me an email to set up a contingent interview? Now is this a second interview or is it a mistake since I didnt have everything done before they called me… I mean they called me literally 10 15 minutes into the application. YEAH I feel ya there!! I applied too with the work@home slot as I have physical, albeit invisible to naked eye, disabilities, and a need to take public transit. I am also a part-time student taking night classes a few miles away from home, on my schools campus(their current program I am enrolled in requires me to be physically IN CLASS up to 16 hours per week, 4 nights per week. No online class offered yet– but I have 2 months left before graduating my program…The call center I applied with is located in my city. I got a recent list of emails in the last week stating that I had to be at least 50 MILES MINIMUM DISTANCE from the call center in my city to have a work at home position—-a very strict “policy in place, to protect the jobs in the actual brick-n-mortar building, which would be unfair to CSRs in the actual building who have to drive there, etc.” This came from an HR rep at the HQ in Nashville. I do have up to 30 hours per week to devote to a job outside of class, and logistics and schedule requirements cause employers to be rubbed the wrong way when it comes to meeting my availability needs…most jobs I can physically do are too far away or the hours don’t coincide with my night class or public transit needs!! The work at home thing works for me!!! anybody having a problem uploading i-9 forms to sitel site?it keeps saying Whoops-a-daisy! We’re sorry, but the page you’re looking for was not found! Has anybody been able to get an anser b ack from any of the recruiters. i rcvd 2 more emails stating that my background wasnt filled out and i did it TWICE. Also rcvd an email from shawn stating they i ddint schedule my drug screen weh n i did it last monday. I emailed 3 recruitrs and rhonda but no reply. any suggestions?? i applied today with Sitel and heard from a recruiter passed and i thought i heard her say someone would call me back with in 2 hours today, but she could have said 24 hours… This company is a direct competitor of the company i just left. Need Help ASAP! I had my interview yesterday and they called me back later that evening asking what time I would be available today for an interview and to go over my internet testing, I did get the the call today and telling confirming that I had received the e-mail regarding where to go and do my drug testing. One of the e-mails was for my background screening. Well it automatically cut off while I was typing my information and when I went back to log-in it said user not found. I then requested a password change and it sent me a new password, When I type in the password it tell me me password expired please enter new password. Well it won’t accept any of my passwords and the requirement is at least 8 characters and 1 alpha numeric. Can someone please help. I sent an e-mail but no response and I want to get this submitted ASAP. I had an interview today and I checked my email and got a message stating that I missed my interview. I looked at my phone and noticed that I had a call from a private number. My phone is set-up to block private numbers. I have since that that feature off of my phone. Can someone tell me if I missed my opportunity for an interview. I sent the lady that sent me the email about the campaign but she has not responded. I tried to reschedule the appoint and it says 1 appointment per candidate. Can someone shed some light on this for me. Try responding back to the “appointment confirmation” email that was sent to you. I had to make changes to my interview a few days ago and it worked for me. They responded back pretty fast. I have received several e-mails about agent jobs for Sitel work from home. I didn’t book the interview for those jobs because my internet did not meet the standards. Now I have met the internet requirments but I have one question. I have a monitor that meets the standards but I do not have a CPU only have laptops. Do I need a CPU for the interview process or will my laptop suffice for interview. A position for Cox was sent to me and I am interested in applying but I don’t want to apply for the job if I am required to have a CPU. Can someone please reply back to me ASAP for time is running out for the interview openings for Cox. Hello – looking for some insight. I applied , did all testing. Did two interviews where both I was told I was hired for Cox Cable. Was told to watch for email about drug test and background check. Also some employee paperwork email as well. Supposed to start class on oct 20th. Have not received any email about anything. How long does this take? Have you heard anything yet????? Hi SLR – no I have not heard anything. I’m looking for other employment. I’m very confused about this company and the hiring process. wait a minute how many interview are there 2 or 3 because im getting an email about another interview after i already did the drug scfreen background check and the 2nd interview and also rcvd the contingetn offer. what is going on? see now i emailed her about EXACTLY that because when i went to book the appt AGAIN for what would be third interview it said macy’s. i emailed her and she said i interview for the one i got a contigent offer for (TRU) even though it says macy’s. i went ahead and booked another one today for tmrw just in case even though THAT bookinow appt setter said AAA. I was undert he assumption it was only 2 interviews. I did both, did my drug test, esign on the sitel site, TWO background checks ( had to complete a second time this morning even though i completed in FULL and submitted it yesterday). oy ve . i know you work for them already was just wondering do you get bathroom breaks and do they offer overtime? oh ok thank you so much for answering back. do u like it so far? Hey anybody know how much the credit check ways on your employment with sitel? I’m suppose to start training October 13 for Toys R Us , but I haven’t got any email or call from Sitel. I been calling them for the past two days but no respond after they told me someone will be giving me a call and to continue to check my email. I don’t know what is going on, but I am really concerned because again training starts Monday for me as well. Also I did pass my two interviews, drug screen, and background, but no email yet. also do you get o take bathroom breaks? anybody who worked/works for them do they offer a lot of overtime? Hey Miss! Glad we’ll be working on the same campaign! I received my computer yesterday from FedEx. I was able to log into the system and get my paperwork off, I just haven’t gotten it notarized yet. Im doing that today though since the IT training is tomorrow. My username for the login was my last name, and the last 2 digits of my birthday and the password was the original password I set up in the beginning. If I were you, I would get a phone number off one of the emails or email anyone you can. I emailed the guy that sent out my forms for my login info because I was having the same problems, but not long after I sent the email, he emailed me back with my login info. Let me know how it goes! I have emailed everyone about this and have not recieved a reply. I did complete all my paperwork and had it notarized this past monday. Did you get any info telling you your equipment was being sent or did it just show up? I am scheduled to start with AON on Monday as well. I have not recieved my computer yet. How did your computer arrive, Ashley? Have you been able to log into the system that had all your info/paperwork for HR? I have not been able to log into the system and have had no luck when I have emailed anyone. I did recieve my invite for IT/setup, but I have nothing to set up……… GRRRRRR!! What do you think I should do? I am so ready to begin working it’s unreal! My username is my first my last name and birth year. the password is what I created in the beginning of the application. I will also be working on the AON campaign. Does anyone know what that campaign will be doing? I received my computer today and start training on Mon. Does anyone know what the NBA Campaign is about? I have an interview for this particular campaign today, but I do not know anything about it. @Miranda, I received my drug testing info (paper) through email, which I had to print and take to the center. I wonder why FedEx delivered yours. Does anyone know what the username is to login? I believe it is your first letter of your first name, then your last name, and some numbers. Do you know if the numbers stand for anything? I cannot get ahold of anyone to find my ID and need to accept my offer. Mine was just my first and last name, no spaces, a lowercase. I was Hired with SITEL for the AON campaign. I have completed all the paperwork online as well as faxed in my information in regards to taxes. I am supposed to start next Monday. I have attempted to login to the SITEL website to check the status of the information in sent in VIA fax was received and processed correctly. I was unable to do so as it indicated USER NOT FOUND. Does anyone know what this means and why I would be getting this type of error at this point. I completed the background check and well as drug test and received my final offer and completed the paperwork associated with the final offer. I sent emails to 2 different individuals in regards to them contacting me to provide me with any additional information needed to complete the process and start working on 10/6/2014 as noted. Has this ever happened to anyone that has been hired. Why would I no longer have access to my information in the system. Does anyone know who I can contact to get clarification on my employment status. Same here. I will receive the computer system tomorrow, and I have a mandatory “setup meeting” Thursday or Friday. @Opportunitywaits, what exactly comes with the system? the wyse, which is a little miniature computer, keyboard, mouse, phone, cords, token passcode generator, and instructions…. I really enjoy it so far. I am unfamiliar with what AON is, but I know the earning potential for Directv is high and there are alot of competitions, bonuses, and great commissions….Training has been alot of fun, and pretty laid back. I filled out the application but wasnt able to do the tests yet. But I got a text today from (205)703-2327 telling me I to respond witv name and ph# for an interview. Has anyone else ever recieved this? I have done all my paperwork except the drug test, background was approved, yesterday I had my second interview, today I had to go get some papers notarized so when I get back home to scan and upload them, I try to log into my account but it says user not found. I wonder is this a glitch or if they have gotten rid of my information. Does anyone know if they hire felons for work from home? I filled it out on application but still nervous since so many people discriminate against it. Sadly no. Most work from home companies do not. Since you will be dealing with sensitive information. I know because my husband has applied to every work from home job and they refuse to hire him because of his felony status. Try 1NW they hire felons just don’t answer yes on your application. They are the only work at home place that doesn’t do a background check. I wasn’t convicted of any fraudulent activity or thievery. Basically self-defense because a guy raped me at 17 but since my state doesn’t support self-defense, I had to do a few years. I put it on my application and it wasn’t turned down so I wouldn’t understand why they would have me go through the entire process knowing my conviction if they don’t hire felons. Hi does anyone know how long it takes to get an email back? I filled out the application and got an email confirming that they received the application and to check my email for further steps. I submitted the application sunday (yesturday) and have not yet heard anything. you know that system where you contingent letter goes to, and you have to go create a password and pin number? I wrote down my pin number and my password…but for some reason I didnt write down what my login name is and it is not my email address is…does anyone know if it is anything special, or what I can do to retrieve it? I called the phone number highlighted on our letter it says it call if we have problems getting our background or drug test, but they said they cant access that system…so I emailed my recruiter yesterday…meanwhile, I cant access the things I have been sent to know what they say….there is an option for forgot password, but not forgot login id name. I got the offer for DirecTV, I kinda really wanted the live chat programs…does anyone know if after we accept one of these offers, if we would get still get offers for one of the other programs if they become available? You won’t get the final offer until after your background check comes back. As for your username you can email Shawna (recruiting coordinator) at Shawna.coy@sitel.com. Once you have the username you reset the password. The email that is in the system that I cant access right now says “Background approved- Final Offer”…is that what yours said after you had your background check and was your final offer for employment? I havnt had my background check yet…and I am waiting for my 2nd interview now..lol see what I mean I am getting things all out of order…. Hi, just wondering if your are actually working the Starbucks campaign. If so, is this job less stressful than other call center jobs and what are the hours like? Starting Toys R Us NHO tomorrow 9/3.This was a 3 week long hiring process. With 3 diffirent start dates that got pushed back. Including additional paper work, the backgrounds took weeks for results.Plus a second phone interveiw. At last though I am offically hired. I will let you all know about how training goes. Oh and BTW I was toldToys R Us had part time too. A recruiter informed me of this. Just FYI. I signed up for FT though. Yeah I’m full time and I have to be available on weekends! Do you? I’m full time too! N yeah I have to be available for weekends, do you? So you were hired for the Starbucks campaign? I just did my first interview for that on Saturday. I was told I was being switched to “active” & would receive an email with instructions for either the background/drug testing or instructions for scheduling a second interview. I haven’t gotten anything yet… From what I’m reading it seems like maybe they’ll get back to me just not on the promised timeline. That’s ok, I guess, but I really hate not knowing. What is the actual training like? Is it like a live class online, do you watch videos, or read materials or what? I’m just curious to know more. Hopefully I hear something soon because the training is supposed to start 11/10! Does anyone know how the training for the AON skill is? I am just curious about what the job will be like!! I don’t know exactly what it stands for but the job description is to greet the employee, answer concerns and questions educating them on their benefits, and solve complex issues relating to their health, savings, retirement plans and human resource related issues!! That sounds fun actually! I am doing Starbucks email and live chat. O OK! You get paid by the hour with that position? Sounds like a really interesting job, I was looking to get a campaign like that one! O OK! That’s great! I make that a hour also!! Do you have morning hours for yours? Ours are more evening which I’m not thrilled about. We have to be available to work between the hours of 7am and 7pm! Are you hired for part or full time? Full time. You? Do you have to work one weekend day? Sounds like your job would not be hard at all, I wish I was hired for that one!! Mines doesn’t sound hard either, but I still wish I could have had the chance to pick which campaign I wanted like some others said they had they chance to do! Wow Carolyn! Sorry to hear that… The toys r us training is ok but I didn’t know we were doing so much. Basically, there is no script so we have to wing it. I now see why there is 3 week training because there is so much to learn and practice. As far as the second interview, that may be something new that they are doing. I had the NHO a week before the first day of my training. As I’ve said before, I was hired on the spot. Guess I got in at a good time then. The only thing that I don’t like is that the class is so big. At least 35 people are in my class, but at the same time, things are organized. I really can’t complain since I have worked from home before and those companies always like to start me off in the afternoon and have me working late. I have 3 school aged children so that is not possible, I have to work during the daytime because that is when it will be quiet in my house. Good luck everyone! I finally heard back. According to them I didn’t complete the 10 year background request form. I did complete it, had to put in my last 10 years of addresses (had to look some up). Their message said, I didn’t have to do another drug test. They just needed a 10 year background check instead of 7 years. So I didn’t complete the drug part, maybe that is the reason they didn’t receive it. I was then offered Toys R Us position, which I turned down. I know nothing about toys, since all my kids are grown. Plus it was full-time and I’m looking for part-time. So I will start looking for something else. Sounds like the second interview is something new they have started. I think they are just overwhelmed right now with new hires, gearing up for the holiday season. Also, they have a lot of new trainers and interviewers from what I’ve read. Which may be the reason they are doing the second interview. I interviewed for Starbucks email and live chat only. Was given an offer. Then today I got an email from an operations guy named David saying they need to do a second interview even though I was already hired. It was very strange but I did it any way. Not sure if I still have the job or not. They were very evasive about the hours of operation for Starbucks. Recruiter didn’t know and guy that did second interview didn’t know either. I’m still up in the air as far as hours. I have a 6 year old son so I need to know what the campaign business hours are. I had to email the HR department and ask. Very unorganized interview process and feel like I’m being led on. If the interview process is like this, I imagine what actually working for them is like. We’ll see. Will update you soon. I’m interested in the Starbucks campaign. I did email Human Resources to let them know that. Did you ever find out the hours? I’m hoping to do a 8pm-3am shift or similar. Hello, are you still working the Starbucks campaign? What hours are you working? I also have a 6 yr old and need to make what ever arrangements necessary once I start. Thanks. Thank you for you responses. I will keep you posted and keep me posted about your positions. I was offered the job also for the dtv campaign, then I received an email about a 2nd interview too. It threw me off because I had already been offered the job last Wednesday and I received an email Thursday about the 2nd interview. I asked the interviewer if this was standard practice(to be offered the job then get scheduled for another interview) she said it was something new they were doing. Did you have the NHO the week before you started training? I’m not worried about the background check or drug test. I wrote documents for Slot machines in Vegas and went through an FBI background check and I never even take aspirin much less anything stronger, so drug test was good. It just seems weird that they put off the training for 2 weeks and then I’ve heard nothing. I received the Macy’s campaign offer on the 11th. @Julia.. I have no idea. I didn’t have a second interview. I was hired on the spot and the recruiter sent me an email within minutes about getting the drug testing and background check done. I went ahead and did the drug test the following day and because it’s escreen, Sitel has the results within an hour after the drug test is done. Usually, the results are sent electronically. Why would they want a second interview, I am not sure but I would do it… at the same time keep your options open. @Carolyn, I am sorry that you have not heard anything. Most likely, you will get an email on Friday, since that is what happened to me. I ended up getting emails from Sitel the friday before my training. Good luck to everyone! I wish I could answer your question but I’ve heard nothing since they sent the email pushing the NHO back to yesterday with time to be determined. If it was yesterday, they didn’t send me an email about it. I know it didn’t go to my spam folder, I get very few spam emails and I always check before deleting. Training is suppose to start the 2nd for it also. At this point, I have no idea what is going on. It seems that I’m the only one that is hiring in to for the Macy’s campaign that is using this site. My contact person is Shawna, whom I sent an email to yesterday and I haven’t received an answer. So I don’t know if she is out for some reason, or my status has changed. As I said before, only thing I know is it still shows me as Holding. I’m just going to put my application in at other places, since I don’t know what is going on here. Good luck on your interview and let us know how things go and if you get any more information. Ahhhh! I just got an email from Sitel saying they want a second interview. I have already interviewed once, tested aptitude, done drug screen, background & credit check. Received Different emails re: training. Now, they wan’t a second interview. what’s going on ? am I hired or not? what can expect from a second interview? This happened with me too for the Starbucks campaign. I was offered the job a few days ago then someone named David emailed me saying they need to do another interview to determine if this is would be the right job. Clearly it would be or I wouldn’t have already been given an offer. Makes no sense. I got hired for the toys r us campaign with the new hire orientation on 9/2 as well. I went to do my drug test this morning and now I’m just waiting to hear back. I hope it doesn’t take long. All I have received is the same email twice which basically explains how things will be done step by step. I’m sure I’m not officially hired yet since I just did my drug test but i hope I hear something today. If anyone else who’s in the toys r us 9/2 class gets any info after their drug test please let us know. I’m concerned since I’m not official and haven’t received another email. Hi… Sitel will send you information via email so keep checking on it. I am pretty sure that you are hired. They do need people because the holiday season is approaching. I am in my second day of training and it is ok. I do like the fact that Sitel provides the equipment for us. Makes things a lot easier. I will see how it goes. Good luck everyone! I’m glad that someone else is also getting the same information as me. Maybe they are just overwhelmed with new hires at this time. I received an email stating the Macy’s orientation was pushed back to yesterday, but then never received any information on the time for it. I sent an email to the recruiter yesterday but haven’t received an answer. When I look at the “Efficient Hire: Sitel Outsourcing” site, it just shows me as Holding and no actions required. Hopefully, we will get some information soon. I’ve not received any paperwork either, besides for the background, drug and credit check. And had to redo the background check, since the first one they sent was for 7 years and they needed 10 years. My hiring process with Sitel started with a application immediately following an aptitude test. It took about 2 hours to complete. I read in small print that once you start the test you can not back out. Then a voice audition. A pre- recorded voice asked me what I would do in this situation ” You have only been employed for a company for 6 months and have received 2 write-ups already for being late. A 3rd write-up would mean termination. Now you are on the way to work and stuck in traffic and are going to be late. What do you do?” Then the automated voice tells you to leave your answer to the situation after the beep.I received email to set up a phone interview with a recruiter the next day. I pulled up the calender and the only day that wasn’t blocked out was that present day. I had 2 times though to choose from. No other appointments for the month were available. The recruiter called me exactly on time and the interview lasted about 30 minutes. The recruiter asked me generic job interview questions. Like ” Why do you want to work at home with Sitel instead of showing up for work at a regular job site? “, ” Tell me a time that you had to help a difficult customer?” At the end of the phone interview with the recruiter I was offered the Toys R Us campaign. I received a contingent offer. A background check , credit check, was submitted along with drug screen. I was told NHO would start on 8/26 with TRU starting 9/2. In the contingent offer it stated something like that I would not be officially hired until satisfactory background screenings was received.They instructed me to look for an email with new hire paper work . Along with instructions for ” the next step” on the Sitel website that I registered on after phone interview . I have not received a new hire packet and have not found the “next Steps” on website. I have received a new email though saying that my training class has been rescheduled. Orientation and training has been pushed back due to “overfilling” the class. The new schedule for orientation is 9/2 then training on 9/8. I am still not sure though if I am officially hired! How soon before training does once receive new hire paperwork? When will I know if I passed credit check for employment? How can I know that I am official hire? Sorry for the delayed response. Well I had the orientation for Toys R US on 8/18 and was informed that the full time position is infact permanent, it’s just the Toys R US project is temporary since the holiday season is approaching. Once that campaign is over in January, we will then be moved to another campaign. The equipment is pretty easy and simple to set up. Make sure that is done before your training. And don’t forget to keep your box because when you decide to leave, you must return the equipment. The I-9 process was pretty tidious but I got through it. My first day of training is on 8/25 and can’t complain because I have the hours that I want. It helps that I work during the daytime because my kids will be in school, so no distractions. Good luck to everyone and I will keep you all posted! Has anyone else been hired for Macy’s? They put off the training for 2 weeks and said orientation would be the 25th, time to be determined. I have not heard anything since and just wondering if anyone else has. Since I would think they would have sent the time by now. I have an interview tomorrow for the Toys R US campaign. My e-mail said that the training begins 8/26, which I found odd since a lot of you that were hired said 8/25 you were starting. I’ll keep everyone posted and let you all know what questions were asked so I can help someone else through this. I signed up for Full time as well but am hearing from a few of you that this is a temp assignment. That’s fine with me. So glad I found this site! I would REALLY love to get in on one of the live chat campaigns. I noticed Toys R US has live chat. I wonder who they use. Is it Sitel? Does anyone know? If it’s like other places I’ve worked for, you will end up doing both phone calls and chat. If you aren’t on a call and someone wants to chat, they’ll put it through just like a call. You just have to keep an eye on the chat box. Sounds like they are hiring a lot for Toys R Us. I’m going to work for Macy’s, we were suppose to start training on the 25, but they pushed it out to Sept. 2. @Eboni can you tell me what type of interview questions was asked for the toy r us campaign? I have an interview Monday for the same position. Thanks! Hi Sandy. By now you probably already have gotten “hired”, of course they do the drug/credit check before it’s official. I was hired this morning but we have so much debt that I’m not sure how well that’ll go over. Basically it was just questions asking about my work experience and if I was able to attend training. The interview wasn’t very long and I was basically hired on the spot. Let us know how everything went. I received a contingent offer letter which I already signed and today I went to do the drug test. Hi Elian! We are going to be in training together!! YAY!! lol…I just completed my New Hire Paperwork and now I have to go to a notary to do my I-9 information!!! If it is for an interview, there should be a link in the middle of the email for you to click. I don’t know why the link at the bottom to fill out a questionnaire is there, but that’s not what you need to click on. It does come up with something funky. Good Luck! All the training is like that, if you miss any time the let you go. Or so I have read. hello i received and email to schedule an interview. but, at the end of the email there is a link that says 2nd part of questionnaire. when i opened it it looked like something sitel would fill out? anyone know what i am talking about lol? @Carolyn, you got a suitable schedule for me. Today I received an email to schedule an interview . It is a full time job for AON campaign. No time offs during training and at least for the first 3 months of work. Availability should be from 7:00 a.m. to 7:00 p.m. CST. I will keep post how my interview went through..
I’m not sure. They may only hire temporary full-time through the holidays. They have a lot of different clients, so if you do well once the position with Toys R Us is up, you can probably transfer to another client, if you don’t get hired full time with Toys R Us. I’m retired, so I only want part-time. I bought a house about 4 months ago and want so many things! LOL I don’t know if Macy’s is just through the holidays or not. Guess I will learn all of that once we have orientation. This is temp till January and then some will be invited to stay on full time but they need more people for the Holidays right now. I go for my drug test tomorrow and submitted the credit/background check but we have so much debt so I’m not sure how well that’s going to go over! @Carolyn… That is what I wanted but I will take what I can for now. I just found out that the “full time” position with Toys R Us is temporary until like January. If I do well, then it will be permanent. Am I the only one offered a temporary position? No Carolyn I just got offered the same as you and took it. It will depend on what position you are interviewed for. The one I am going to work for is Macy’s part-time and you have to be available to work from 8 am to 3 pm. When they send you an interview request for a certain position, they will have the hours required and either you can accept or not. Hi, I have just completed the long assessment, typing test and the voice audition. So, I will just have to wait for any news. I am bilingual and I did not see any requirement for that. I also have an 8 year old daughter and would like to work from 9 to 3 or from 8 p.m. to 12 a.m. I am not sure if this schedule would fit their needs. I’m glad I didn’t get Toys R US! I know nothing about toys anymore. LOL All my kids are grown. Also, I didn’t want full time. I will be part-time but it’s mostly mornings and I would prefer evenings. I’m hoping maybe after a few months I can change to evenings. Hi Carolyn! I’ve just completed the interview and I got the job. My new hire orientation will be on August 19 and I start training on August 25. The campaign that I will be working on is Toys R US. It is full time and they will provide the computer and headset which is cool. All I have to do is provide the computer screen and I have that already so I am good with that. Let’s see what happens and congrats by the way! Hi Eboni, I have a new hire orientation on August 19th as well and I start training on August 25th. I am not doing the Toys R Us campaign tho. I am doing tech support for Direct TV (I think). I will be working part-time but training is full time. My schedule will be 7am to 1:30pm. @Carolyn… That’s exactly what happened! I went to the calendar, scheduled the interview for tomorrow morning. I can’t wait to see what that is like. By the way, how did the interview go? I received the same email. All spots were taken. Then a few days later I received another email for a position and when I went to the calendar, they had an opening on the same day. So hang in there, I believe when they want to interview you for a position, it will show open times. Hello! I just wanted to let you know that I went through the interview process with Sitel and I was able to land the job! I am so excited about working with this company!! Thank you for having such an informative site. I have been looking for a good WAH job for months and I’ve been visiting your site and applying for WAH jobs that you list everyday! The hard work has definitely payed off and thank you again so much for your informative info on your site. Congratulations, Aly! I’m so glad you find my site useful! Hi! I have applied for Sitel and I did get an email inviting me to an interview. The issue is that when I click on the link, the calendar for August and September shows up, but no times listed. Was that the issue with you? Why would I get an email saying to schedule an interview, but no spots are open? How long did it take for you to get hired? I took the assessment test online and I am still waiting. Does anyone know how to get a phone call to them to check the status of an application? Hi All, I have a 2nd interview with Sitel tomorrow and was looking for more information on this interview and what to expect. The first one was a general sitel interview and this one is for the roadside assistance project. Any information will be great. Thanks in Advance. Sorry for the late update. I did have my interview a few days after my post above. I was told this was for the Toys R Us Project. The recruiter told me they do send a computer out . I was asked a few questions about past employment and what my availability would be. I told the recruiter I have a young son and would only be available between 6 am and 5:00 pm. She snarled at me and stated most agents need to have a least 2 shift availability. The next day, I received an email stating I was not selected for this position. I have to believe it was because of my inflexibility with the shifts. I am so happy to have finally heard back from them. I had pretty much counted it as a waste of time having done the application and testing after checking my email everyday for about 2 weeks. I got email from them today saying that I passed the skills and appitude tests, and that I could follow a link to get scheduled for an interview, but my computer doesn’t meet the upload speed requirements, which I actually think they probably have listed wrong, but there is no way to get around that. They require min download speed of 1.5mbps, and min upload speed of 1.5mbps. I use the Clear network and they only give me 100mbps. I do a lot of both up and down loading of files on a daily basis, and my up and download speeds are fine. I’ve also noticed that none of the other telecommute positions require THAT high an upload speed. Most of them require that you can upload in the 0.5mbps area. (thats why I’m thinking its probably a typo). I Can’t schedule an interview because of my supposed lack of internet upload speed, but it still feels to good to know that I was able to pass their very intense appitude testing! I just had an interview today. I was called 15 minutes late, so I ended up going on with my night. When I got home from grocery shopping, my mom told me someone had called from for an interview and they would call back in 10 minutes, which they did. The interview lasted about 10 minutes and was very easy. First, I was asked to go to http://www.speedtest.net and was told more about what the company, does while waiting for the results. After the results of my speed test, I was then asked a few questions such as: “why do you want to work for Sitel?”, “tell me about a time you had a difficult customer interaction?”, and “do you have any restrictions?” I have a 6 year old son that can only be in day care from 8a-5p mon-fri so I asked if they would consider me for shifts between 7am and 5pm MST, and was told that should not be a problem. Last, but not least, the interviewer instructed me to go the site, sitel.com and tell her who the President and CEO of Sitel is. After that, I was told I was being moved forward and would receive an invite for a second interview within 24 hours to learn about the current project(s) offerings. I’ll update once that happens! I applied to Sitel about two months ago, did an assessment, then had two interviews. On my last interview, someone told me that my interview results would be sent to HR, and they would let me know from there. I guess I did not get the job, because it has been over a week, and they still have yet to contact me by phone or email letting me know about my status. They could at least have the decency to let applicants know after an interview on whether or not they got the job, or at least inform on whether or not they are pursuing other candidates that better match the qualities that they are looking for. I don’t think that is too much to ask. If Sitel interviews someone two or three times, at least let them know something so that they are not waiting by the telephone and constantly checking their email. People do not have time to wait for a company to get back with them when they say they will, when in reality, they have no intention to. Sitel in my opionion, just from my opionion, is very unprofessional and disrespectful. I’ve been with the work from home program taking roadside assistance calls for nearly 10 months. The things I like: We started off at a shameful $9.00/hr, You will get regular increases over 6 months until you hit 10.50. 2) I have health and dental insurance 3)They are less careless than the 2 other WAH call centers I’ve worked for. they do try to be professional. Doesn’t always work out, but I appreciate the effort. 4)They send you a computer, phone, headset, and keyboard at no cost to you and they support/replace when there is a problem. This was huge for me, because tech support at the last 2 companies have really messed my personal computers up – and they take no responsibility. 5) Calls are generally quick, and you will rarely need a supervisor once you get the hang of it. What I dont like: After 6 weeks of training I had no clue how to operate the dispatch software because they dont have a training version. 2) They will tell you that many things cant be taught in training as an excuse for missing the opportunity to educate us on certain best practices. 3) Supervisors are hard to find when its time for them to take a call – and often, they won’t do it. 4) When the system goes down, unexpectedly, it will be the worst day of your life. Customers will wait 2,3,4,5 hours for roadside assistance and there will be nothing you can do about it – and nothing you can give them to make up for it. 5) The better health insurance pkg isn’t an option for agents until you’ve been there for 3+ years. I think if you’re willing to pay for it, you should be able to choose but no. not here. 6) This is the worst for me – They are very evasive about schedules during training. You will train at regular business hours. When you get to on floor training, the hours may be slightly later. You wont know your regular hours until about a week before you’re finished with on floor training. Then, you’ll have to compete to keep your shift if you’d like to keep it. They do a shift bid every 3 times a year, and if you’re not a top performer, you will lose your shift and be moved to difficult hours like 4-midnight or 5pm-1am. You’ll be asked to go part time or quit if you can’t deal. Of course, none of this is mentioned during training or interviews. There is never any mention of you losing your schedule. This is why turnover is high. Otherwise, I think more people would stay because it isnt as stressful as other types of call center work. They are willing to work with school schedules and in rare cases will make an exception for home life issues but it only lasts until the next bid. Its very disruptive and difficult for employees to adapt to. What are the hours for training? I was looking for a part-time work at home solution as I work 3-10 at a call center. I have applied with this company so many times never hear anything back from them I do have the qualifications that they require plus more why do they not respond after ward? Check your spam file in email service used to apply. That’s where mine was so that I could complete the assessments. I have also applied with this company – I have all the qualifications and more. I, too, get the letter that I won’t be moving forward with the company… I’m baffled. I work for this company. They have not paid me or 3 other employees. When we inquire about our checks, they say that they’ve mailed them only to find out days later that they have not.. I would not recommend this company. I worked two weeks for absolutely nothing. Calling HR is JOKE. You’ll be holding for hours. Rhonda Wells is one of the people who deal with finding out what happened to your check. Her voice mail is always full and she never returns emails. Don’t waste your time folks.. I have worked here since September.. my first check did get lost in the mail..but it did come about a week later after the rest of my class received theirs…every check since then has come right on time every time on the dot direct deposit to my bank account…..so I dont know…I never once was told to contact ronda about my check when it was delayed, I just called the hr, I know when I changed my direct deposit I emailed hrss.payroll @ sitel.com maybe you could try to email them?